I’m not sure how much of a good idea it would be to subsidize free bus use. I’ve not read much about it in the literature, so I assume there are important obstacles and problems. Given the fact that our heavy subsidies to single-occupant vehicle (SOV) travel practically beg people to get around in such an unsustainable way, it is entirely possible that even a free bus would not attract huge numbers of riders. And it would hurt the transit service image pretty badly if we were heavily subsidizing fairly empty buses. Again, the uneven playing field for transportation makes it quite rational to choose SOV travel. Luxurious, plush, highly comfortable car interiors with full music, seat, and temperature control. Such amenities are rarely, if ever, available on a city bus. A perception of protection from crime. The car as a “suit of armor” helps explain why so many parents of their collegiate offspring want their children to own a car (especially in the aftermath of a headline news crime in the media). Bus rides involve riding with a group of strangers (who are potentially dangerous). Door-to-door speeds are usually much faster compared to a bus. Ability to tailor your trip: Carrying small or big loads, carrying carpooling friends or significant others, leaving and arriving when you want to, going to any destination that you desire. Driving a car is a powerful status symbol. Free parking spaces are found at nearly all SOV destinations. As Donald Shoup points out, this is such an irresistible subsidy that free parking should be considered a fertility drug for cars. Can free bus passes overcome all of that? Even in the face of cheap gas, free and abundant parking, and free roads? The following is the table of contents for the January 20, 1999 draft of the Urban Design Plan I prepared for Gainesville, Florida. Congestion Mitigation and Air Quality Improvement (CMAQ). This is a federal program that was implemented to support surface transportation projects and other related efforts that contribute air quality improvements and provide congestion relief. I passed along to him my thoughts about this program. Build cleaner, more fuel efficient vehicles. You will notice that none of these techniques do anything to modify unsustainable American behavior towards more sustainable behavior. Engineers and politicians in this country have always believed it is “unAmerican” to do things to modify behavior so that it is more socially responsible and sustainable. Instead, the engineer does what he or she is trained to do, and that is to tinker with the technology to solve problems. When all you have is a hammer, all problems look like nails. The newly emerging paradigm in transportation and environmental management is that solving problems by “enhancing supply” is not sustainable. We must do things that modify behavior (demand) so that it is more sustainable. One very effective way to do that is with pricing, and if the market cannot properly price scare or vulnerable ecological and other resources, we need government to step in. When it comes to transportation, we need to use both pricing and scarcity to modify demand toward sustainability. What the engineers and elected officials did not know (or were happy to ignore) is that doing things like increasing road capacity (road widenings, turn lanes, etc.) or providing more free and abundant parking (and other forms of transportation subsidies) totally swamps any gains we might realize in terms of reducing “stop and go” traffic, or in terms of getting more “free-flowing” traffic. Because increasing transportation facility supply makes it easier and cheaper to unsustainably drive a car everywhere, which modifies behavior in an unsustainable direction. We do nothing to discourage “low priority” motor vehicle trips, such as a drive across town to rent a video. With the heavy subsidies to enhance supply, we almost beg people to make such trips and live in remote, sprawlsville locations. As a result, many recent studies are finding that increasing supply (primarily by widening roads with more travel lanes or turn lanes) eases congestion for only a tiny period of time, after which the congestion becomes worse than before we spent millions to “correct” the problem. The most concise, profound explanation of this is by Anthony Downs, who calls it “The Triple Convergence” in his Stuck in Traffic book. 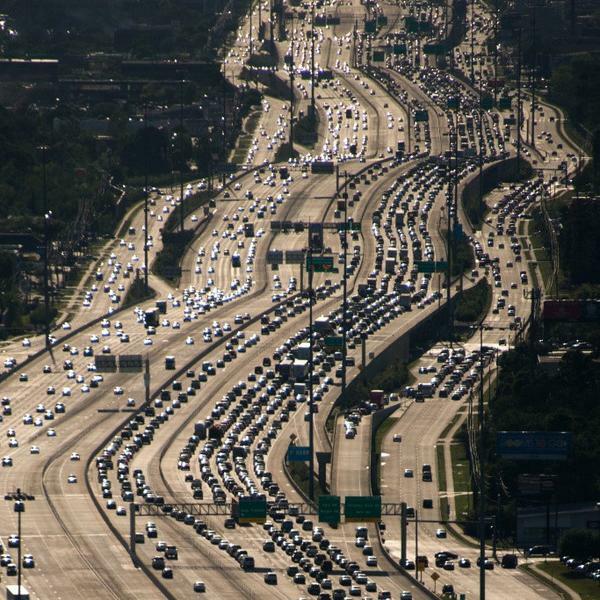 We are inevitably affected by the Triple Convergence when we add capacity to our transportation system, so every time we add capacity by widening roads, we make things worse. An important corollary here is that transportation drives land use. It is our transportation system that will determine if we have sprawl into our outlying, environmentally sensitive areas — not regulations, land use plans, or enlightened politicians. These informed researchers and planners increasingly call for “planned congestion,” in which we passively apply none of the conventional “supply” methods (expanding road capacity, etc.) to address congestion. Instead, existing congestion is leveraged as a very effective way to get compact development, discourage sprawl, reduce air pollution, and reduce gasoline consumption. Because congestion discourages motor vehicle trips (and encourages bicycle, bus, carpool and walking trips), research now shows that more congested areas (on an area-wide basis) produce less air pollution and gas consumption. Because this seems so counter-intuitive and non-sensical, politicians, engineers, and real estate people (who benefit from unsustainable transportation and sprawl) can get away with claiming that road widenings, turn lanes, free and abundant parking, etc. will reduce air pollution and gas consumption. Expanding road and parking capacity ignores the behavior-modifying effects of increasing the transportation facility supply, which totally overwhelms the minor benefits to individual cars of enhancing free-flowing traffic. When we take into account the system-wide impacts and behavior modification that occur when we do things like widen roads, we find that the emperor is wearing no clothes. Transportation is truly a zero-sum game. Nearly always, if not always, when we make it easier to drive a motor vehicle, we make it harder to travel another way, which profoundly modifies behavior. We should not be fooled into thinking it is inevitable that we are all doomed to live a life of extreme auto dependence, wherein we are forced to make every trip, no matter how trivial, by car. So in conclusion, we need to be very, very careful when we hear claims that it is best to solve congestion, energy, and air pollution problems by making it easier and cheaper to drive a car. My opinion is that the millions we spend to do that only make things worse.